ORCHARD PARK, N.Y. – As the Rams offense retired to the locker room at halftime following a sluggish first half in which yards were difficult to come by, they began an immediate search for some kind of spark. They didn’t much care where it came from but with usual spark plug Danny Amendola inactive again with a foot injury and the Bills taking great pains to shut down the run game and Steven Jackson, there was no doubt it would have to be a more unusual suspect. Enter receiver Brandon Gibson. After finishing the first half with one catch for 10 yards on just two targets, Gibson took the reins. Indeed, Gibson became Bradford’s favorite target and finished with 100 yards on six catches and one gigantic, game-winning touchdown catch. In the final 30 minutes, Gibson had five catches for 90 yards and his production gave him his first career 100-yard game. With Amendola out, the receivers and Bradford have insisted that filling the void is a group effort but that group still needs someone to lead the charge. As Gibson continued to find ways to make plays at the most important of times, his teammates followed his lead. Austin Pettis made big plays, Chris Givens made big plays,Lance Kendricks made big plays and on and on. Givens’ role has only increased in recent weeks as the majority of Amendola’s looks have gone Givens’ way. That hasn’t left many chances for Gibson but as the longest tenured of the Rams wideouts, Gibson hasn’t let any of those things bother him in his pursuit to contribute. There was no better time than the second half Sunday after the Rams offense mustered just 71 total yards in the first half. Trailing 6-0 coming out for the third quarter, the Rams immediately put together their best drive of the day. And no play on that drive was bigger than Gibson’s 22-yard catch and run to the Bills’ 25 on third-and-7. That helped set up Jackson’s 1-yard touchdown run and got the offense into something of a rhythm. Still, it was the big plays on the final drive that mattered most. On the game-winning drive, Gibson narrowly missed a chance for a big play down the left sideline before bouncing back with a catch for 15 yards on third-and-10 to Buffalo’s 13. Two plays later, Gibson squeezed the winning touchdown in the back of the end zone and helped set off a wild celebration. RUN DOWN: The top priority for the Rams defense all week was slowing down the Bills’ fourth-ranked rushing attack led by the two-headed monster of C.J. Spiller and Fred Jackson. There was further motivational fuel thrown into the mix during the week when one of the backs appeared on a talk back and made mention of a targeted number for fantasy production against the Rams. Defensive tackle Michael Brockers and Co. didn’t take too kindly to that. Whatever the additional motivation, the Rams defense absolutely answered the bell in shutting down Buffalo’s vaunted rush attack. The Bills finished with 61 yards on 20 carries with nothing longer than a 14-yard burst from Jackson. Jackson finished with 14 yards on nine carries and Spiller added 37 yards on seven totes. Defensive tackle Kendall Langford said the defensive line put it on itself to slow down Spiller and Jackson. INJURY REPORT: For the most part, the Rams made it through Sunday’s game relatively healthy but did have a couple of losses that will have to be monitored this week. Safety Craig Dahl left the game with a concussion and did not return. Darian Stewart replaced Dahl and posted three tackles. Dahl will have to go through the normal battery of tests before he is cleared to return this week. Left tackle Rodger Saffold was in and out of the game with back spasms.Wayne Hunter filled in for him but Saffold was able to make it through. His status will be clearer as the week goes on but coach Jeff Fisher offered a short take on the matter. 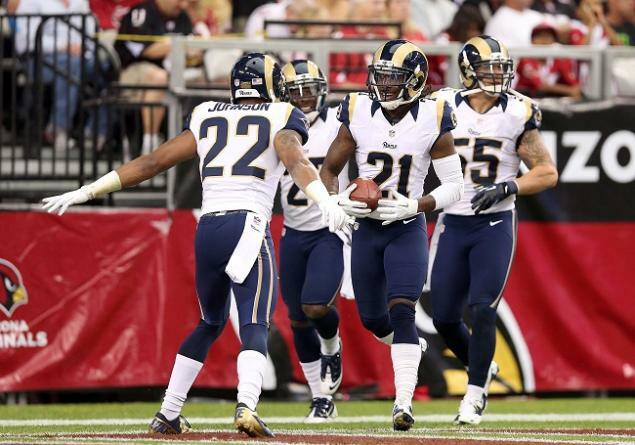 “He just had a hard day,” Fisher said, acknowledging that Saffold would be OK. IN THE HUNT: With three games to go in the season, the Rams remain right in the hunt for a playoff spot but didn’t get much help from their NFC counterparts on Sunday. Teams still in the mix with them such as Seattle, Washington, Dallas and Minnesota all won but the Rams do play the Vikings, Seahawks and Tampa Bay in the final three games. While the Rams are pleased with their progress, they know they can only focus on continuing to take care of business to have a legitimate shot when the dust settles. Heading into Week 12, the St. Louis Rams hadn't won a game since Week 5 of the season, and many thought their playoff hopes were dead in the water. Enter the outlook at the end of Week 13 and things have done a complete 180. St. Louis is now 5-6-1 and in the thick of the NFC playoff hunt. After two wins in a row, the Rams are currently eying the division rival Seattle Seahawks for the No. 6 seed. They are still two games back because of Russell Wilson's late-game heroics at Soldier Field. However, their four remaining contests are all winnable games from a record and talent standpoint. Buffalo, Tampa Bay and Seattle on the road with Minnesota at home—honestly, are any of those four teams any better than the Rams by a wide-margin? Some would say Tampa Bay and Seattle, yet St. Louis is undefeated against the NFC West this season and Tampa Bay has had a hard time deciding whether or not they are pretenders or contenders. Moreover, it's also important the Rams don't lose focus and get ahead of themselves. Jeff Fisher knows better than anyone that the league is truly a quarter-to-quarter league. Today's game against the 49ers is a perfect example of that analogy. Heading into halftime, Coach Fisher's club looked miserable, yet they never lost hope as they outscored San Francisco 16-6 in the second half. The second half onslaught all started when the Rams failed to convert on offense deep into 49ers territory. On fourth-and-1 from the four-yard line, quarterback Sam Bradford tried to hit wide receiver Austin Pettis in the corner of the end zone, which would have cut the game to a one-score affair. Unfortunately for the Rams, San Francisco cornerback Tarell Brown knocked the ball right out of Pettis' hands. A momentum swing appeared to turn in the 49ers favor, except a Colin Kaepernick intentional grounding penalty from the end zone handed St. Louis their first two points of the game, one drive later. Not to mention the fact momentum was back in its favor. Fast forward to the fourth quarter when the Rams were down 10-2 with 3:04 left to play—it was third-and-3 from the 49ers own 17-yard line, and they were looking to run a pitch play to wide receiver Ted Ginn. The play appeared as if it would have picked up the three yards needed to pick up the first down, yet a poor pitch from Kaepernick allowed Janoris Jenkins to fall on the ball and roll in the end zone from two yards out. The fourth-quarter touchdown marked his third defensive touchdown in the last two weeks. Janoris Jenkins has as many touchdowns as Matt Forte this year. Undoubtedly, it would be easy to say Greg Zuerlein's 54-yard field goal to win the game in overtime was the biggest play of the game, however he would have never even had the opportunity if it wasn't for Jenkins' scoop and score. We all know Brian Schottenheimer's offense wasn't scoring a touchdown against Vic Fangio's defense without Danny Amendola. GLENDALE, Ariz. -- Janoris Jenkins has been known to make headlines for the wrong reasons. Not this time. Jenkins, who slipped to the second round of the draft -- the 39th pick overall -- because of off-the-field issues during his college career, returned two interceptions for touchdowns and St. Louis dominated the second half to hand the Arizona Cardinals their seventh loss in a row, 31-17. Sam Bradford had a pair of 37-yard touchdown passes -- to Lance Kendricks and Givens -- for the Rams (4-6-1), who snapped a five-game winless streak and beat Arizona (4-7) for the second time this season. The Rams threatened to extend the lead when Lindley threw right into the hands of linebacker Harvey Dahl, who returned it 38 yards to the Arizona 12. But after a holding penalty, Greg Zuerlein's 35-yard field goal try was wide left. "Those two where I was going to Larry, the two picks, were just real mental mistakes," Lindley said. "It was things that, it's unexplainable right now, but I made a bad play. Larry is doing the right thing. I'm just off a little bit on something, rushing something, not trusting what I'm seeing out there." With Lindley throwing short passes over the middle, the Cardinals went 91 yards in 15 plays on their first possession, using up 8:55 of the first quarter, to go up 7-0. But on the first play of the second quarter, Jenkins stepped in front of intended receiver LaRod Stephens-Howling, intercepted the pass and ran untouched 36 yards to the end zone to tie it at 7-7. Danny Amendola, who played despite a foot injury that prevented him from practicing all week, made a diving grab of Bradford's 38-yard pass to the Arizona 19 on St. Louis' next possession and two runs by Jackson put the ball on the Arizona 7. But Patrick Peterson picked off Bradford's pass over the middle in the end zone to end the threat. Lindley's 25-yard pass to Rob Housler and Andre Roberts' 13-yard run set up Wells' 12-yard scoring run that put Arizona back on top 14-7. The Rams tied it 14-all when Bradford threw over the middle to Kendricks, who rumbled into the end zone on a 37-yard scoring play with 1:53 left in the half.